Enjoy a special night out on Wed. Feb 14th for a Valentine's Day Dinner at Country Life Restaurant. We created special menu for Feb 14th with one seating at 6 p.m. Reservations are required and the cost is $25 per person (excluding taxes) for an all-you-care-to-eat menu. 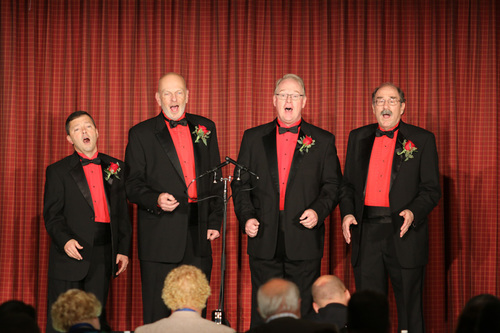 Plus, making their annual appearance The Cheshiremen Chorus will sing a couple of their favorite love songs! White Lasagna: This lasagna has a luscious creamy cashew sauce, layered with summer squash, zucchini, onions, carrots and broccoli. Topped with non-dairy cheese shreds and it’s gluten free! Mongolian BBQ: This outstanding BBQ is filled with red and green peppers, broccoli, onions and Portabella mushrooms with a rich beefy sauce. Served with basmati rice. Veggies include ginger vegetable steamed to a delicate crunchy state with candied ginger and fresh cilantro. Plus, baked potatoes — these organic potatoes served with rich and creamy cashew cheese and delicious almond sour cream. Dinner includes a full 24 piece salad bar with all the fixings! Desserts: Cherry Cheesecake — this all-time favorite has a delicate lemon flavor and is topped with sweet red cherries. Our layered Mocha pudding cake has a pecan crust with layers of creamy vanilla, carob, and a sweet cream filling. Hors d'oeuvre will be served. Cost: $25 plus tax. All you can eat. Time: One sitting at 6:00 p.m. IMPORTANT: Reservations are required to make sure a spot is reserved for you.